This lovely, 3 bedroom spacious house is ideally situated in a gem of a village – close enough to both Annecy and Aix-les-Bains to give you quick and easy access to two of France’s most popular tourist towns – but without all the expense and tourists! Situated in peaceful village in a stunning National Park, Lescheraines is the place the French in the know go when they want to ski in winter or vacation in the summer. Little wonder, as it is the best of both worlds! It’s calm and relaxed instead of crowded and bustling, and you get a taste of real life in the Alps, not the tourist version. But for a small picturesque village it has everything you’ll need from a fabulous bakery/cake shop, to speciality chocolate artisans, pubs, restaurants, cafes and even a post office to send your picture postcards from. If that isn’t enough, a few minute’s walk away there are three lakes with a fantastic leisure base and activities for all the family including a play park, swimming, water slides, water skiing, kayak, fishing, tennis, boules, cycling, horse riding, tree climbing activities, volleyball and more. In high season the pub/restaurant at the base has concerts most weekends and the village’s own tourist office can advise you on local walks, activities and events. It’s a thriving local community so there’s plenty going on in and around the area for all the family. As for the house, it’s modern and spacious but in the local Alpine style with garden, patio, parking space, lounge/kitchen/diner, TV with UK channels, 2 double bedrooms, 1 bedroom with 2 single beds, an upstairs bathroom with bath and shower and another toilet downstairs. The fitted kitchen has full cooking facilities and a washing machine and dishwasher. Wifi is included and pets are welcome. .....It's a great place for anyone, and particularly popular with families, walkers, cyclists, skiers and people who like outdoor activities or just love fantastic scenery in peaceful settings. If you are looking for the best that France has to offer in terms of outstanding natural beauty, Alpine village charm and major league tourism - but from a more convenient, comfortable and affordable base - then this is the ideal place for you! I first came to the French Alps as part of my year abroad for my French degree and immediately fell in love with the place. So much so that I decided there and then that I would like buy a place and eventually live there. However, before I did that I thought it would be best to travel all around the world, just in case there is anywhere else I liked better. After visiting a great many countries all across the globe, I came to the conclusion that the French Alps is indeed the best place I have ever been to. I work as a writer, and also play music. I also like sport and socialising. The French Alps is great for this, because there's always activities going on, the people are great, and there are countless walks and bike rides to do, beside which the weather here is usually brilliant. The first thing which took me about the region was its towns, spectacular scenery, great weather and incredibly warm and friendly people. Before buying I did actually travel all over France, to check out other areas. After driving the length and breadth of France I realised I would never find an area I like as much as the Alps, and so regardless of the extra cost I knew that was where I wanted to be. It's also great all year round. I love skiing locally ski in Winter, and relax when it's warmer - which is pretty much the rest of the year! The village is small enough to have a real sense of community, yet for such a small place it also has pretty much everything you need. I think someday I will come and retire here, but in the meantime is just great to come as often as possible. I certainly make the most of the house. In Winter it is very convenient for local ski resorts, which in my opinion are better than the bigger ones - the slopes are great, it is cheaper and there are less queues. The house is also centrally located, & it's great it has pretty much everything. 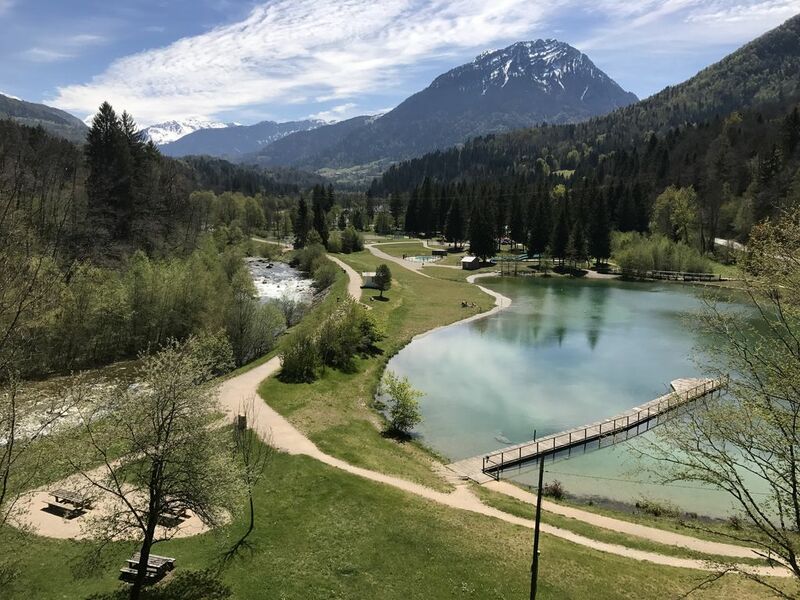 The village has everything you need, it is in the middle of a beautiful National Park, its bang next to a lovely leisure base which has lots of great activities, it is also convenient for Annecy & Aix les Bains which have got to be two of the best towns in Europe. On top of that there always seems to be activities going on around the region; anything from concerts to circuses. If you want to just relax and have peace & quiet it's great, but if you want to get out & have fun then it's equally as good. Upstairs bathroom with bath, shower, sink and toilet. Lounge/diner with flat screen TV with UK channels. Two sofas, dining table, coffee table, stereo, DVD player, log fire. 2 great ski locall resorts (Aillion le Jeune and Mageriaz) 20-30 minutes drive. These are fab ski resorts very popular with the locals, and are much cheaper than the larger resorts & without the queues! If you prefer larger resorts then these are not too far away either. Near to reputable golf courses in Annecy and Aix les Bains (around 20 miles away). Notes on accommodation: The house is in a quite residential area, and the person who was looking after it lives next door. The village is very peaceful and would suit someone quiet looking for a peaceful holiday. If you are a party animal this is not the property of the you. The house is a non-smoking house. However, smokers would be welcome to smoke in the garden. Wifi internet access available. There is a room fan. Outside: Small garden with patio area, and patio table and chairs. There is no swimming pool as such, but the house is very close to a leisure base where swimming is allowed free of charge in the beautiful lake. Cleaning / Towels / Linen / Maid service: Towels and linen are included and change at the end of each stay. Other: Wifi internet available throughout for a small surcharge. The property is clean, modern and well equipped, very pleasant and everything we needed for a family of 5. Great to have good WiFi and access to British TV! The village is full of character and in beautiful surroundings. We would thoroughly recommend staying here. The house was situated in a superb location, living in the village was great as we were able to walk to the bakery and convenience store within a few minutes. We were slightly disappointed with the swimming lake nearby as although it was as beautiful as it looked in the photos it wasn't particularly dog friendly. The house itself was very comfortable but we had an issue with the parking as because we were 2 couples we had 2 cars which meant one of them had to be parked on the road. We were also unaware that we had to pay a local tourist tax which although wasn't very much we thought this should have been included in the price of the holiday. We looked through the details of the house again when we were on holiday but couldn't find any mention of the extra tax. One of us was a keen cyclist and this was a fantastic place to cycle. Overall we had a very pleasant stay and the area is absolutely stunning!!! Thank you for your very positive review of the house and stunning location. The small local tax is indeed mentioned, it's well known and it's a very small daily rate. Dogs are regularly walked around local lakes and on lots of tracks, woods and walkways in the area. It's a fantastic area for dog walking and walking in general. As for the car parking, it's a very unusual comment! Most guests are very pleased there is a place to park right next to the house! Many holiday lets don't have any designated parking space at all, let alone one right on the doorstep with additional free parking 30 seconds away! We are a family of 5 and we had the best holiday is this house and were blown away with Lescheraines...it was simply beautiful. The house was really lovely and had everything we needed. The wifi had a good signal which was great for our teenager. I had the best sleep as our bed was soooo comfy. We really enjoyed sitting and eating in the garden at night as it was so peaceful after active days. We loved walking to the villafe each morning to buy fresh bread which was only a few minutes walk. We loved that our younger children could cycle as there were no roads so it was really safe. The locals were just so very nice and welcoming. The lakes were just a 10 min walk and swimming in the lakes surrounded by the mountains was the highlight of the holiday. The whole area was just breathtaking and we cannot wait to return. A very beautiful part of the world and the perfect location to stay. Many thanks for your of positive review of my property and the French Alps. It's a lovely house in a location all the locals know and enjoy, but it's a bit of a secret outside of France, which is one reason why, unlike some other locations, it isn't overrun with tourists. Sometimes in summer you can be the only one swimming in the lake, and in winter now and again I've been the only person on the local ski slopes. It's hard to find place like that, and I much prefer it to skiing anywhere else! Like you, I fell in love with the house, the area and the people. I like going back as often as I can, and you are welcome to come back any time you like. We had a lovely week's holiday here last year and found our stay really comfortable and relaxing. As it was October and out of season the village was quiet, but very friendly when open and we found some great local places to eat and drink, and even enjoyed breakfast in the sunshine in the lovely garden. Great location for exploring gorgeous places like Annecy and the mountains - we were mountain biking and hillwalking and enjoyed having all of this within a short drive. Loved our stay and would recommend it to anyone who likes france or / and the outdoors! Well maintained property situated in the beautiful Alps. Plenty of facilities within walking distance of the house, including a highly recommended Fromagerie. Stayed here a couple of times and always found plenty of things to do in both Summer and Winter time. Great chalet in the beautiful area of Haute Bauges that is easy to get to from Geneva. French family ski resorts close by - great if you want to be one of the few brits or alternatively in an hour you can be at the Aravis range and one of the many brits. Chalet is in a typically French village. Would be great in summer also - mountain paths, clear lakes and beautiful meadows. The nearest lake with swimming available is within easy walking distance. Geneva is a little over an hour away by motorway. Chambery airport is closer but is usually only available in winter. Annecy airport is close but is very small. Other airports include Grenoble and Lyon. These are around 90 minutes away, or more depending upon traffic. Car hire is pretty much essential. Annecy about 18 miles. Aix-les-bains about 18 miles. Chambery about 25 miles. Geneva, just over an hour away. Mont Blanc - 90 mins away. Yvoire - just over an hour away. Cluses - just over an hour away. Local shops, restaurants and leisure facilities are within easy walking distance. There is a cashpoint in the village and the nearest bank is around 5 miles away. There villages in a tourist area and there is a tourist office in the village with plenty of information on lots of things to do and see locally.